Creating tables can be frustrating experience in any spreadsheet program, but a new 'Explore in Sheets' feature makes creating tables easy. Simply type what you want, like "bar chart for ice cream sales" or "line chart of data, projected, actual," and Sheets will make a chart for you. Super cool. 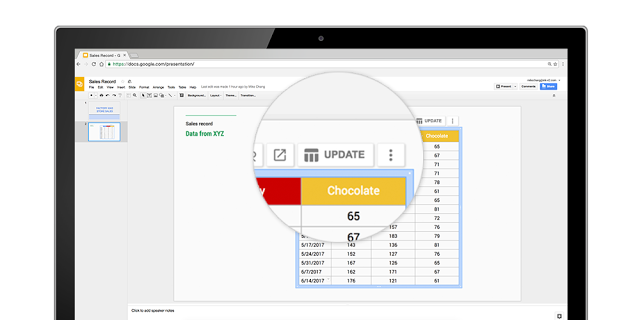 Google Sheets will also now sync data to Docs and Slides. So if you copy and pasted a table from Sheets into Slides, and you made some changes to the original file, you just have to press the Update button to retrieve the latest data. Other improvements include changing keyboard shortcuts, creating and editing charts with a new sidebar, more spreadsheet functions, increased support for charts in the Sheets API, and a new print interface. All of these changes are rolling out starting today to the Sheets web app. You can find more information at the source links below.